My beautiful grandmother, Lillie Harvey, died In June 1974. She was the granddaughter of John McHugh Senior, the pioneer who established the famous McHugh Bros Pottery. Inspired by her mother’s memory, my mother started collecting McHugh pottery. It became an absorbing hobby and my parents collected an impressive collection of many hundreds of pieces. In the process they talked to many people and collected many old memories. This lead to her renewed interest in the McHugh family itself, and our greater ancestry. This was in a period before Trove and when queries were made by letters which were posted and time consuming visits to libraries and the like. Over a period of years Mother did an amazing job of establishing both her and my father’s family trees. Whilst I provided some encouragement and computer support to Mother, I was busy building my own life and not really interested in history; which I then thought to be rather dull. Later on, however, I did reflect from time to time on how her work and materials might be best shared and saved in the long term. Late one Friday evening in 2006 I received a phone call from a man in Melbourne who wanted to come and visit me if we were related. His name was Bob Cocker and he seemed to know a few names in my family so I invited him and his nephew John to lunch. We had a lovely afternoon talking about many things, mostly family history, and we agreed to collaborate. Bob was spending his retirement from Telecom travelling around the country, contacting possible relatives and adding to his research. As he was leaving he told me his major remaining task was to find someone who could build a website to share all his Cocker information. I thought about it briefly and, encouraged by my wife, clearly with a rush of blood to the head I told him I could do that. Sadly, Bob died in 2010 but the Cocker family website has its roots in his passion and it remains a tribute to his memory. He gave me all his findings, which I combined with Mother’s information and then set about reflecting on the best way to progress. 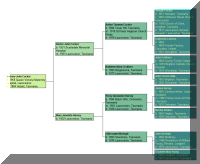 There were many free and paid family tree web site options but I didn’t like any of them as I thought their designs weren't sufficiently user focused. I decided to publish a framework of births, deaths and marriages which would allow stories and images to be progressively added. I had to design and build it from scratch so it was a big task. About five years ago I rebuilt it to meet contemporary web standards using PHP and CSS. I introduced a dual menu system which allowed me to integrate all of my various families while still keeping it manageable. Thus there is a separate 'sub site' for each of my Great grandparents plus the Harris family which is my wifes. I also introduced Ancestors pages which are akin to outer branches of the tree and show the family of those who married someone in the main tree. My primary focus is on following them from their arrival in Tasmania. This has allowed me to add a huge number of links across our families, showing the complex relationships. The ancestor pages are less fully researched and often incomplete, only including the relevant family members. As the number of people passed 25,000 I also added a custom web site search function. This all happened because somewhere in the process of just building a web site for the Cocker family I became badly infected by a bug; a family history bug which now consumes a lot of my money and most of my time. 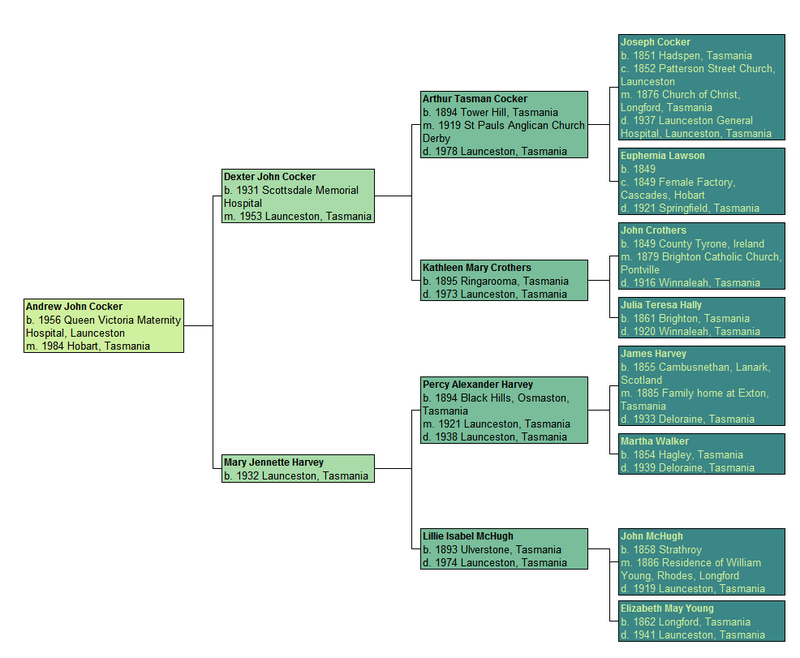 How could I ever have found Tasmanian and family history dull? There are so many wonderful stories still waiting to be told. Bob Cocker did one other thing for me. He introduced me to my third cousin, Suzanne Collins, born in Launceston but now living in Perth, Western Australia. Sue is a voracious researcher and she kept me on my toes for years as we collaborated to fill in the gaps. She is also very generous in often helping me research some of my family lines that she has no direct interest in. Others have also made a major contribution to the content of this site. Ian Harvey has generously shared his extensive work on the Harvey family while the core of the Walker family history comes from the book, A Goodly Heritage which is also explained in a separate introduction. I also extend my deep felt thanks to Danny Crothers for his generosity in sharing his scholarly and detailed research on both the Hally and Crothers families. At some stage I turned to my wife’s (and hence my daughter's) family history and I added that. I was fascvinated to find that her GG grandparents had been witnesses at the marriage of my G grandparents in 1876. My website is not historically correct because it does not include sources and references. I have designed it to be as easy as possible for strangers to find themselves and their family and to start their own journey of discovery and it is beyond my resources to publish sources. I am happy to respond to specific queries. It was gratifying in 2015 when the Australian National Library assessed this website as meeting its criteria for significant Australian documentary heritage and adding it to its Pandora program. This means that a twice yearly archive of the site will be saved in perpetuity. It also means that the web site content is now searched as part of the overall Trove content and this will raise its profile and accessibility. If I have one disappointment it is that more people have not chosen to write a paragraph or story or add a photo for their loved ones. Please do consider this. Find more information on how here. Likewise, if a living person finds a reference to themselves that they are unhappy about, please let me know. I claim copyright on the entire content of this website which I have created. However I grant any individual permission to reproduce part of it for their own history purposes if, and only if, the source is acknowledged as www.cocker.id.au. I have recently ventured into DNA testing (Y, mtDNA and autosomal) as a way to both prove (or otherwise) and extend research findings. It seems to have absorbed whatever spare time I once had. I would be particularly pleased to hear from anyone else in the ‘family’ who has been tested.